The Mets, who apparently win series now. On Sunday, Jose Reyes recorded his third home run of August. However, it should also be noted that Jose Reyes is bad. I could list all the reasons why this is true, but you’re reading the game recap of the 49-66 New York Mets. Suffice to say, you’re not ignorant of the countless reasons why Reyes should not be on this club. You’re not an idiot. You’re not management. What is troubling is what is looming. A hot end to 2017 served as justification for re-signing Reyes during this past offseason, a re-signing which afforded him the opportunity to challenge for the crown of worst player the league has to offer. Comments about the FO’s loyalty to Reyes also lead one to believe that they’ve dug their heels in until Reyes is ready to call it quits. Either that, or they see admitting Reyes is bad and cutting bait as an admission that they were wrong — effectively viewing it as a sign of weakness. One home run doesn’t matter. Two home runs don’t matter. Jose Reyes is still bad at baseball. In addition to that, his constant platform as a leader in the clubhouse, despite his DV past, is past the point of being just problematic. It is deeply ingrained into how Jose Reyes ended up back here in the first place. It is flat-out wrong. Maybe this comes off as holier-than-thou, or maybe it comes off as grandstanding on a clearly bad player. But consider how fanbases really work. The better you play, the more you’re liked. All can be forgiven, so long as you can produce. This is why it is so awful for Reyes to still be here. The opportunity to play his way into ‘redemption’ narratives is the only real purpose Reyes has left. Every good outing gives the fanbase, which gave Reyes an ovation upon returning from his DV suspension, greater reason to rally behind him. The issue isn’t just that every win where Jose Reyes is prominently featured feels problematic. It isn’t that Reyes can’t perform above his current level. The issue is that Jose Reyes becomes normalized with every positive PA. His very real and very consequential decision has been reduced to an ability to hit over the Mendoza line. An ability to present a respectable OPS, or play decent enough defense. And with every opportunity he is presented by the Mets, this issue has a chance to grow. I fully expect Reyes to get hot again. It always seems to happen that way when Reyes is close to the chopping-block. But it really doesn’t matter how well he plays. It distracts from the real issues at hand: that Jose Reyes should not have the opportunity to fix his credibility by swinging a hot bat. That Jose Reyes should not be on this team, nor should he have ever been allowed a chance at a second stint (considering the context). 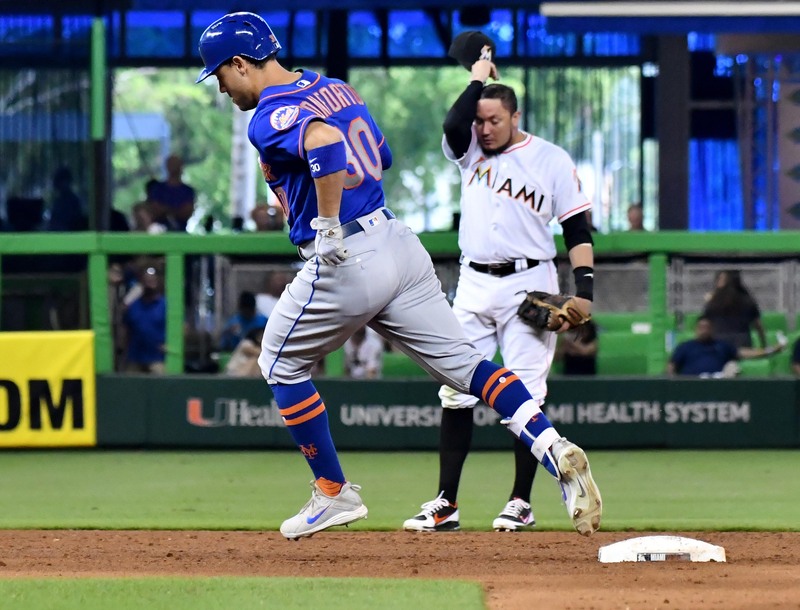 So, yeah, Jose Reyes wasn’t the only good thing to come out of Sunday’s action against the Miami Marlins. Noah Syndergaard pitched well, Michael Conforto homered and Seth Lugo recorded his first save. The Mets won their second consecutive series! There were other positives that could’ve drawn the focus of the game, but the Reyes issue cannot possibly be addressed enough. Especially when he appears to be on the precipice of a hot streak. The Mets stay in the New York area to make up a rainout against the Yankees. It’ll be a battle of aces as Jacob deGrom squares off against Luis Severino. After a two-game mid-week series against the Baltimore Orioles, the Mets go up against the Philadelphia Phillies five times. In facing the Phillies, the fifth game of that series will be the MLB Little League Classic, which takes place in Williamsport, PA.
Game recap August 11: O captain!